Home » Events » Lectures » The Mobile Artist . . .
City views were both urban encomia and forms of visual knowledge in the sixteenth and seventeenth centuries. The two functions were sometimes furthered by the figure of the artist at work, whose presence, embedded in the landscape, attests to the reality of the representation. The motif acquired new significance for European artists who journeyed to the Levant, often in the company of government ambassadors or agents, and for whom urban topography was an important theme. This talk explores the figure of the artist on the move in Guillaume-Joseph Grélot’s drawings for Ambrosio Bembo, a young Venetian noble. Grélot had been working in Ottoman and Safavid dominions since 1670, accompanying Jean Foy-Vaillant, a physician and numismatist, to Istanbul and the Aegean Archipelago, and later the Anglo-French merchant Jean Chardin to Persia. The artist rendered inscriptions, monuments, and prospects for Vaillant and Chardin, both of whom were under directions from the French King. Grélot changed course in Isfahan, where he met Bembo, and they departed together for Aleppo by caravan, continuing to Venice by sea. 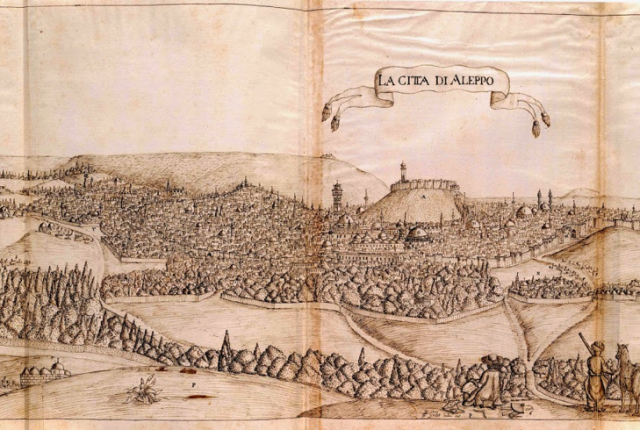 For Bembo’s diary, the artist produced fifty-one drawings of bridges, antiquities, costumes, monuments, caravanserai, monasteries, harbors, and city views. In four of the prospects—Aleppo, Persepolis, Respé, and Canea (Chania)—Grélot inserted himself into the landscape. The trope indicates he envisioned the series would be engraved, since the motif was a pictorial analogy for the replicative process of the medium, particularly for printed urban views and landscapes. Intriguingly, however, Grélot provides a performative variation on the theme: dressed in various guises—in Persian, Turkish, and European costumes—the self-portrait orients analysis toward questions pertaining to working in and moving between cities in diverse Islamic jurisdictions. Situated on the edge of the topographical view, as a surrogate who observes the site for the viewer, the artist also brings into focus the experience of seeing from a distance and looking close-up that characterizes, and also betrays, as will be suggested, the ambivalence of the early modern foreigner on the move. Bronwen Wilson recently joined the faculty of the Department of Art History at UCLA, where she specializes in Renaissance and early modern art history. Her current book project, The Horizon and Inscription in Early Modern Mediterranean Travel Imagery, brings to light innovative uses of media and formats through which diverse temporal experiences were materialized. She also writes on the history of Venetian art, the subject of her book The World in Venice: Print, the City, and Early Modern Identity (winner of the Roland H. Bainton prize for art history in 2006), and she has published several articles on European images of Ottoman Turks and Turkish costume, which informs her current research. Northern Italian portraiture and physiognomy are the focus of several articles and her book manuscript, The Face of Uncertainty. Edited volumes include Making Publics in Early Modern Europe: People, Things, and Forms of Knowledge (2010, with Paul Yachnin) and The Erotics of Looking: Materiality, Solicitation, and Dutch Visual Culture (2011, with Angela Vanhaelen). Two current collaborative research projects are: Making Worlds: Art, Materiality, and Early Modern Globalization and Early Modern Conversions. She has taught at the University of British Columbia, McGill University, and recently at the Sainsbury Institute for Art in Norwich in the United Kingdom. This lecture is presented as part of Early Modern Cosmopolitanisms, a lecture series hosted by the Transnational Subjects and Early Modern Empire Working Group and sponsored by the UCLA Center for 17th- & 18th-Century Studies. Contact Jeanette LaVere at jlavere@humnet.ucla.edu or 310-206-8552.